Midway in the climb to New Idria. Car-free riding. 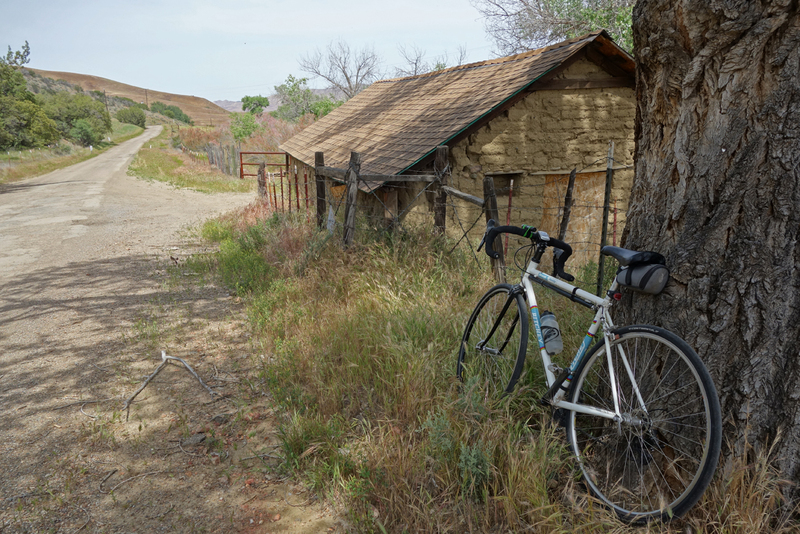 Without question one of the best rides I’ve taken includes a visit to the historic mining town of New Idria in the wilds of San Benito County. It offered everything an adventure rider could ask for — long stretches of dirt, a climb to 4,500 feet, fording a river, visiting an old mining town, and no cars. The down side is that the one-day ride took a long time. Over the years I’ve slowed, to the point that we were finishing the ride in the dark. Not that I didn’t like riding in the dark with a powerful light. It was just too much. 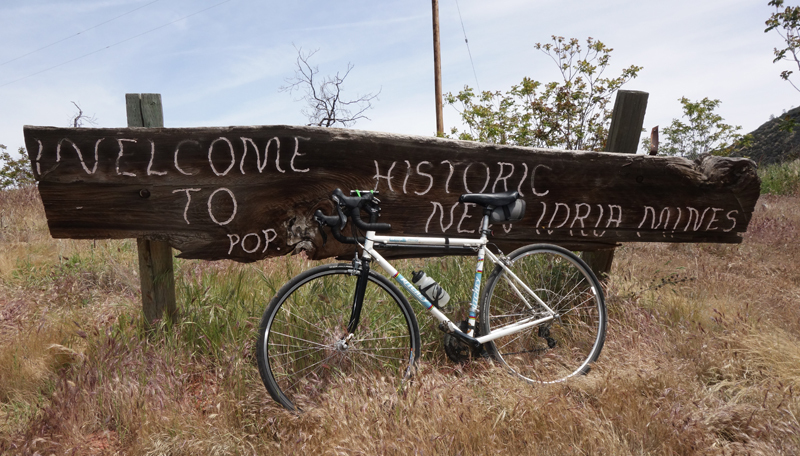 I decided enough is enough and thought of another ride — out and back to New Idria starting in Paicines, altitude 680 feet. It’s 104 miles — plenty of miles for an aging crank — there isn’t any traffic, the countryside is beautiful and I could still see New Idria. I headed out at 7:20 a.m. on Saturday under clear skies, temperature 48 degrees. As luck would have it I saw two riders with whom I rode the loop route, just getting started on their ride. They figured we’d meet up later, but I figured we wouldn’t. My New Idria ride is far easier now, much easier than even I imagined. Welcome to New Idria, population 0. Weather couldn’t have been better as I headed into the hills on a gradual climb that would take me to the 2,200-foot pass at Summit Ranch, according to the road sign. I didn’t see a reading of more than a brief 9 percent grade on my GPS. I also didn’t notice any wind. By the time I reached the only store 27 miles into my ride — Panoche Inn — it would be a 20-minute wait before it opened at 10 a.m. I searched for water, but found none. I had to decide — wait or carry on? I figured I could beg for water from target shooters who frequent Griswold Canyon 10 miles ahead. I also wanted to check out a small campground at the canyon entrance. I continued, still not experiencing the usual winds that blow through Panoche Valley. I noticed the grass is already brown and I didn’t see any evidence that the winter had been wet here. 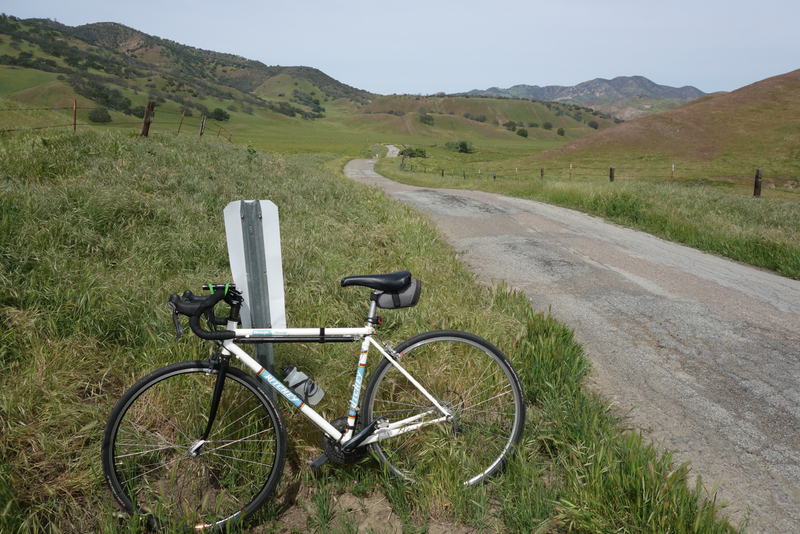 I did cross a small stream higher up on Panoche Pass, something I had never experienced before. I found the campground, but it’s nothing more than a pit toilet and some signage. Fortunately there were shooters but I decided I could wait until the return ride. It wasn’t all that hot, about 65 degrees. Steady climbing took me to 1,700 feet, where I found the view more appealing — green grass and cows by the hundreds enjoying their morning munch. The patch-quilt road had new patches of black tar to fill in the worst potholes. Potholes and patches made riding a challenge as I bumped along and favored the smooth dirt shoulder. At the adobe house the climbing starts getting serious. I noticed a rock collecting camp, Benitoite, on my right and made a note to stop there to look for water upon my return. Adobe house, where the serious climbing begins. The last quarter-mile to 2,648 feet altitude offers strong riders a chance to test their resolve on loose dirt with grades of 20 percent. I have long since lost any need to prove my mettle. At the mine I watched a drone take flight and no doubt I can check YouTube for the footage. The old mine now has a chain-link fence around it and almost all of the other buildings have been torn down. As a Super Fund site, I can imagine that the area will continue to change, unless the EPA is de-funded in the years ahead. I turned around at 12:12 p.m., plenty early compared to years past. At the mining camp I didn’t see anyone, so I walked around looking for water, finding a large plastic jug next to a hose attached to a spigot. After a pour I confirmed it was water, a bit turbid, but probably drinkable. I figured the worst that could happen would be a dose of mercury, equivalent to eating fish from the bay [I waited a week to be sure. The water did not make me sick]. The ride back included a brief tailwind and more bumpy road. I didn’t see any Super Bloom, just tall grass with a mingling of wildflowers. Back at Panoche Inn I stopped and purchased some refreshingly cold Gatorade from the new owner Sam, Larry and wife having retired late last year. They served up huge ice cream cones for $1 and had $1 bills plastered on the ceiling. After 15 minutes I headed off into a headwind at 2:20 p.m., but nothing too bad. It helped cool things down as temps had climbed into the mid to upper 70s. The climb didn’t seem nearly as bad as years past, mainly because the afternoon was still young and I hadn’t ridden loose dirt to 4,500 feet. Fortunately things cooled down a bit as cloud cover moved in. The journey ended at 4:39 p.m. with 104.5 miles on the GPS. It was a relatively easy ride with only 5,400 feet of climbing (compared to 7,750 for the loop ride), better suited to my riding interest these days. 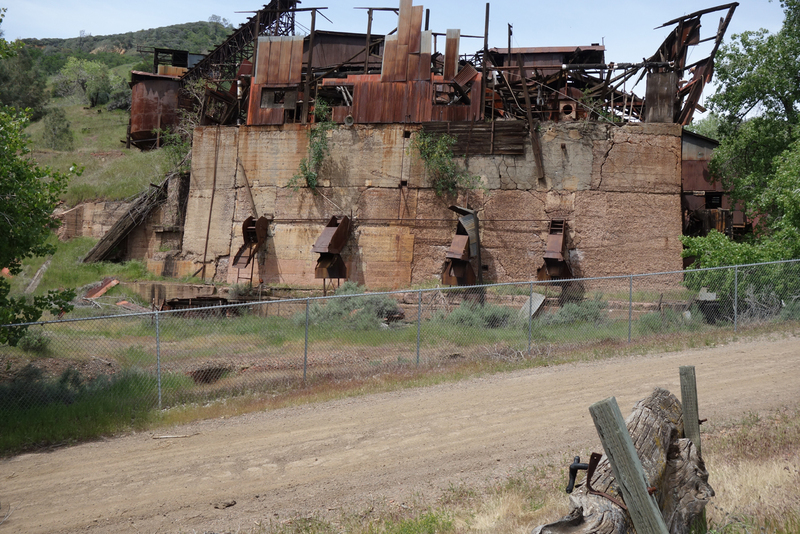 What’s left of the mining community, which thrived from 1857-1972. This entry was posted on April 23, 2017 at 10:10 am and is filed under Ride reports. You can follow any responses to this entry through the RSS 2.0 feed. You can leave a response, or trackback from your own site.